Following up on recent ideas, and trying to get a few components finished for the next Megablitz Squared evolution, the basing project worked better than I’d expected. And it was achieved more easily. 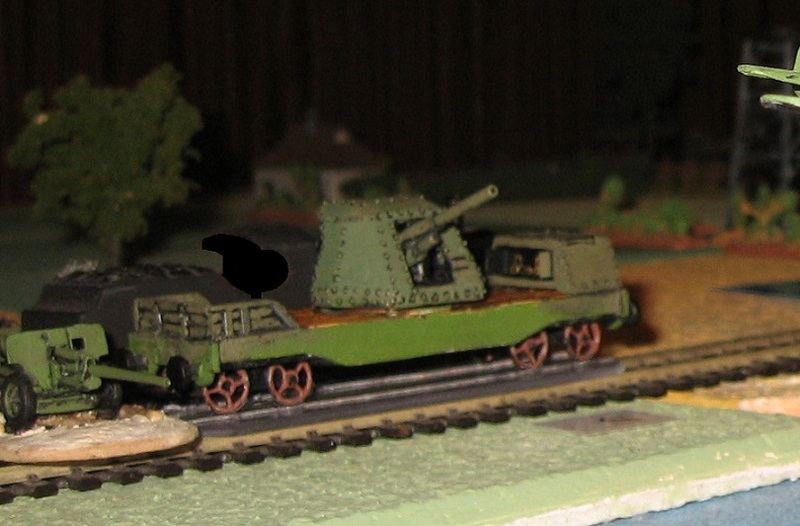 This is a naval gun mounted on a flat car – it isn’t an armoured train, but represents a whole range of rail mounted medium to heavy artillery moved around by rail, and often found defending Soviet cities. It can be shifted around by locomotive, fired from its railway mount if necessary, or craned off and dug in for static deployment. The Sea of Azov Naval Command also ran some armoured trains, at least one of which (‘Za Rodinu!’) had naval guns on its armoured carriages (so although not armoured in this case, it will serve equally well in that role). In resolving the basing, my problem was this …. I dislike wargame train models that sit on the railway lines like toy trains. Partly this is because they don’t actually always fit, derail easily (the wargame table just doesn’t function like a train set), … and look dreadful when anything other than exactly fixed in. 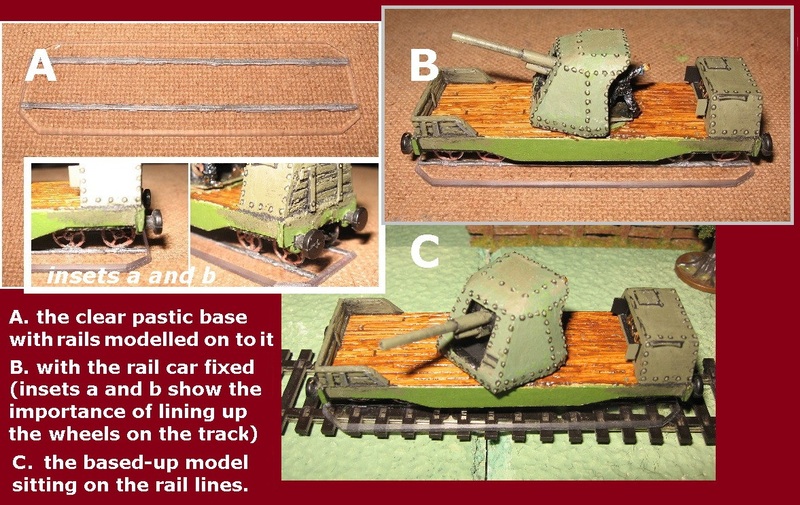 Partly it is to deconstruct the illusion that the model is a single train component (no it isn’t – the base represents a military unit, the model on it simply indicates what sort). But it is also because all that matters for the function of the game is which squares the rail assets are in (and there may be many of them … fighting stands, supply units, transport etc. ): so I want the models to be able to stand within the appropriate squares, not necessarily on tracks, but look OK without me needing to model sidings etc.). Clearly the model components need to be on their own bases, compatible with sitting on the rail lines but equally sitting beside the tracks elsewhere in the square. Basing also encourages the models to stay where they are put when they are back in the box. So it seemed likely that a clear plastic base would be the best solution – definitely not a railway modelling solution, but allowing the wargamer imagination to accept the illusion that it is on the tracks, giving it a ‘lift’ roughly similar to the basing up of the other models in the game, and maintaining a reasonable appearance when not lined up on the rails. I have used a similar solution for AK 47 civilian cars, and had always planned to get round to trying this for WW2 trains. Nevertheless it is a relief that the finished look seems acceptable (I can get on do the rest now!). For this first go, I made the rails out of thin card, but found that this material has a habit of twisting and isn’t that easy to fix down exactly right. It needs to be exactly right, as the wheels need to line up with it when you fix down the vehicle (otherwise, whats the point?). For next time I will try to source a neat and straight bit of pre-cut plastic strip from the model shop, glue this to the underside of the wheels (guaranteeing the line-up), then fix that assembly down onto the base. The track, of course just wants to be the top of the rail (most of the height is ‘within’ the plastic depth of the base). For the flanges on the wheels, either cut a groove in the base for them (a very good way of making the bond permanent), or flatten one portion off so it will sit down onto the rail convincingly. The base is made from clear (polycarbonate) plastic sheet from the garden centre. It can be a pain to use until you get the hang of scoring it and snapping it (a deep and accurate score gives a reliable snap, any sort of clumsy cutting causes cracks and fractures). I bevel the edges (as I do on all my bases) with whatever comes to hand (files, sandpaper, both work well enough). I had thought of stripping the rails off the sleepers, now that the trains will come with rails on their own bases (so the model will then sit down nicely, and the rail lines will look a bit more map-like/ a little less ‘train set’-like. I mocked this up in the test shot above just by turning the track upside down). I’m not so sure now … I didn’t have time to do that before setting up the most recent game, and it all looked fine just as is. I’m definitely dropping down in track size, but otherwise, it may look fine without the extra effort. 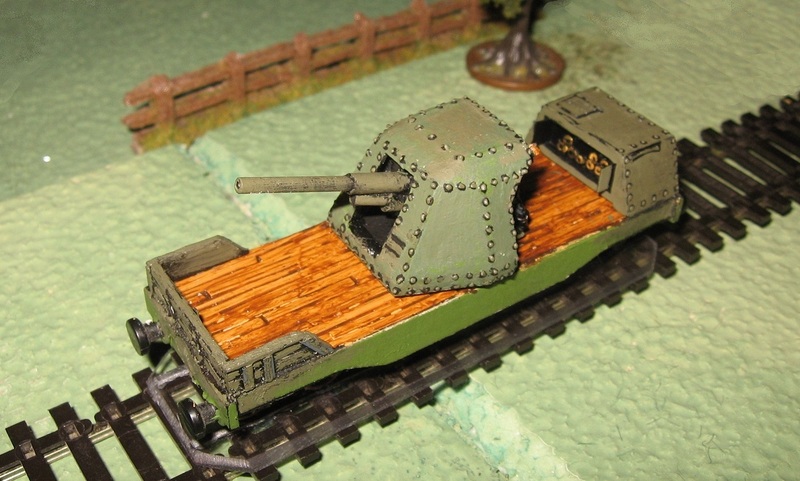 What a very eye-catching (and sensible) solution to the problem of fitting railways into wargames. I have always tended to use rail track that was one scale down from the figure scale (N gauge with 20mm) but then the rolling stock did not look right. By using your solution, I might be able to end up with something that is much more aesthetically pleasing. Many thanks for your idea! Great idea Phil. I’m greatly enjoying your train photos.